A complete list of monster slayers is below. Sometimes LDS bishops get special callings; sometimes that means being the agent bishop for battling demons. Newly married for time and all eternity, a young wife must deal with the meddling ghosts of her two dead predecessors. Two Mormon missionaries continue to pound the pavement after a zombie apocalypse. Pirate ghosts have been spotted on the Great Salt Lake—and they want something. The story of Ruth is reenacted in space—with an alien Boaz. 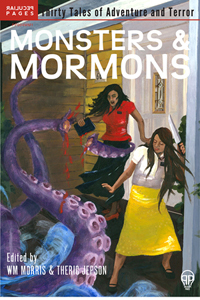 Two poems mesh the Mormon with the monsterish. A gelatin salad runs amok at Relief Society enrichment night. The H.P. Lovecraft mythos ensnares a Mormon brother and sister. Joseph Smith fashions a golem—a Porter Rockwell golem. A Mormon couple honeymooning on the Amazon encounter the beasts in the jungle. A Mormon musician goes the time-honoured route of making a deal with the devil. In a post-apocalyptic near future, a pair of Marines must turn to their Mormonism in order to have a chance of fighting the enemy. A pioneer journal entry takes a cybernetic turn. Things turn noir for a Mormon PI investigating a murder in Salt Lake City. The World invades the kitchen of a spunky old lady. A poem mixes the domestic with the horror. Every missionary feels homesick now and then. Is it worse if you never even see the sun? Erasmus Snow and his four wives battle ninja monkeys…and something strange. A young woman, now back in the fold and struggling to reacclimate to life as a young single adult, faces her fears on Utah Lake. A young man prays to know which Zombie Battling Organization is true. Battling the spirit of a wolf, a man wanders out into the Utah desert only to find a young woman bleeding to death. A missionary’s new companion appears to have a bit of the mad scientist in him. A solar behemoth must choose between its new Mormon faith and the jealous god it has always known. Not all testimonies are solid as a rock.